Menlo Park Wine Walk Featuring Santa Cruz Mountains Wines The Santa Cruz Mountains Winegrowers Association and Station 1300, a Greenhart Land Company project, present the fourth Taste of the Mountains Wine Walk on Saturday, December 2, in downtown Menlo Park. All ticket profits will benefit the Menlo Park Atherton Education Foundation (MPAEF). Local boutique wineries of the Santa Cruz Mountains will be pouring wines in various designated tasting locations along Santa Cruz Avenue. Participating wineries will offer wines for sale at the Bottle Booth with 20% of proceeds benefiting MPAEF. Participating wineries include Burrell School, Cinnabar, Kings Mountain, Mindego Ridge, Roudon-Smith, and Silvertip. California 2017 Harvest Report The California Wine Institute reported that the 2017 harvest wrapped up early following summer heat spurts and a growing season that saw significant rain throughout the state ending a five-year drought. While October wildfires in the North Coast wine communities made international headlines, the state’s vineyards and wineries were not significantly impacted. 90% of the harvest in Napa and Sonoma and 85% in Mendocino were already picked and in production at wineries before the fires. The overall crop size is estimated at 4 million tons, down slightly from 2016 and above the historical average of 3.9 million tons. The vintage promises to be of excellent quality. Outstanding in the Field Grateful Table On Tuesday, November 21, at 1:00 PM, the public is invited to a special Thanksgiving feast prepared by Chef Tyler Florence and friends, featuring the local fall harvest set in an idyllic vineyard on the Napa-Sonoma county line. Outstanding in the Field is partnering with Visit California to produce this feast. While most of the wine region was untouched by recent fires, the people who grow, pour, craft and welcome need your support in rebuilding their communities. The best way to show them your love is to visit. All ticket proceeds of this event will benefit nonprofit fire recovery charities. Tickets are $500 per seat. Visit www.outstandinginthefield.com. 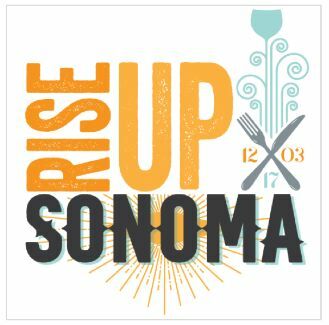 Rise Up Sonoma On December 3, 2017, Rise Up Sonoma will bring together iconic Sonoma County wineries, chefs from Sonoma County and San Francisco and legendary music stars to benefit those affected by the Sonoma County fires. The event will be held at Sonoma Country Day School Jackson Theater at 4400 Day School Place in Santa Rosa. Limited to 650 seats, each ticket is $500. VIP tickets, limited to 100 are $1500. All proceeds will be distributed to charities in support of victims. Participating wineries include Arista, Benovia, CIRQ, Davis Family Winery, duMol Winery, Eric Kent Wine Cellars, Failla Winery, Hartford Family Winery, Hirsch Vineyards, Joseph Swan, Kistler, Kosta Browne, Lombardi Wines, Martinelli Vineyards & Winery, Siduri, Three Sticks Wines and Williams Selyem. For tickets: www.brownpapertickets.com/event/3153869/. Anderson Valley Winegrowers Event Changes for 2018 The second annual Holiday Passport Weekends will be held December 9-10 and 16-17. More than a dozen wineries will host this ticketed event, offering special wine tastings, holiday decor and crafts, food and wine pairings and more. Toys will be collected to distribute to local children by the Anderson Valley Fire Department. The International Alsace Varietals Festival has been renamed the Anderson Valley Aromatic White Wine Festival and will be held February 24-25, 2018. Wineries from California, Oregon, Washington, Alsace, Germany, New Zealand, Michigan, Vermont, New York and more will be pouring Riesling, Gewürztraminer, Pinot Gris, Pinot Blanc and Muscat. The technical session on Saturday morning will include an educational food and wine pairing taught by educators of the Culinary Institute of America and a presentation of German wines by wine writer Dan Berger. 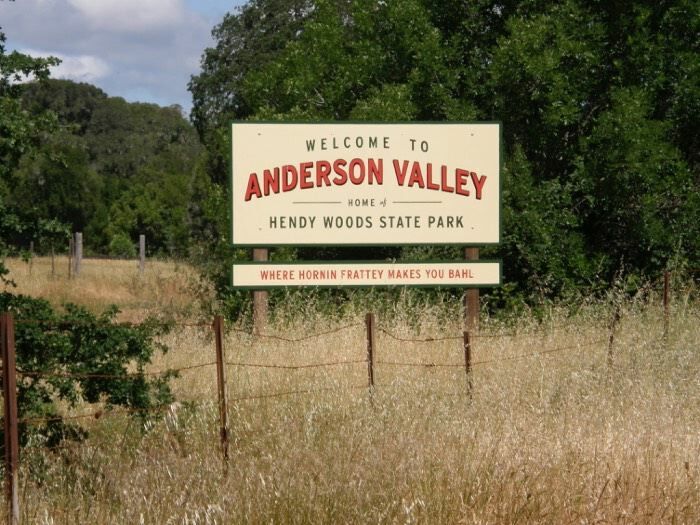 The 21st Annual Anderson Valley Pinot Noir Festival will be held May 18-20, 2018, at Camp Navarro, an historic Boy Scout camp turned “glamping” event center. The majority of the weekend’s events will be held at Camp Navarro, including the educational sessions, grand tasting and winemaker dinners. On-site accommodations like cozy cabins and tents will be available for attendees to book through Camp Navarro. The only summer event, the Anderson Valley Barrel Tasting Weekend will be held July 21-22, 2018, allows consumers to taste soon-to-be-bottled wines from more than 20 local producers. Additional information and tickets for all of these events: www.avwines.com. 2017 Sonoma County Harvest Fair Professional Wine Competition This wine judging event is the largest regional wine competition in the United States. Wines must be made with grapes grown in Sonoma County with Sonoma County designated AVA as only region listed on the bottle. -Double Gold Pinot Noir (unanimous gold by judges): 2015 Balletto Vineyards Cider Ridge Vineyard Russian River Valley Pinot Noir ($44), 2016 Balletto Vineyards Emerson Vineyard Russian River Valley Pinot Noir ($44), 2016 Balletto Sexton Hill Vineyard Russian River Valley Pinot Noir ($44), 2015 Balletto Vineyards Winery Block Russian River Valley Pinot Noir ($44), 2014 Ektimo Vineyards Sonoma Coast Pinot Noir ($38), 2015 Francis Ford Coppola Reserve Martinelli King Vineyard Russian River Valley Pinot Noir ($38), 2014 Garnet Rodgers Creek Vineyard Sonoma Coast Pinot Noir ($36), 2014 Hook & Ladder Third Alarm Russian River Valley Pinot Noir ($40), 2015 J. Cage Cellars Nunes Vineyard Russian River Valley Pinot Noir ($40), 2014 Jigar Graham Family Vineyard Russian River Valley Pinot Noir ($65), 2015 McIlroy Cellars Lila Lane Vineyard Sonoma Coast Pinot Noir ($34), 2015 Mersenne Russian River Valley Pinot Noir ($37), 2015 Selby Calgary Vineyard Russian River Valley Pinot Noir ($52), 2015 Sonoma Coast Vineyards Freestone Hills Vineyard Sonoma Coast Pinot Noir ($40), 2015 Sonoma Cutter Vineyards Sonoma Coast Pinot Noir ($30), and 2015 Willowbrook JSO Limited Estate Russian River Valley Pinot Noir ($42). Pali Wine Opens Tasting Room in the OC Pali Wine first reached out from its Lompoc base to open a tasting room in Santa Barbara. Now it has opened a tasting room in the Anaheim Packing District in the renovated MAKE building. Oregon Winemaker Patricia Green Dies The former winemaker at Torii Mor and Patricia Green Cellars was found dead at her cabin retreat in Roseburg, Oregon on November 6. She was a low-profile winemaker who had a dedicated following for her Pinot Noir wines. Founders Dan Kosta & Michael Browne Leave Kosta Browne Winery The Press Democrat reported on November 9 that Dan Kosta and Michael Browne are leaving the winery they founded on a shoestring 20 years ago. Kosta Browne Winery has been owned by J.W. Childs Associates of Boston since January 2015. The 30,000-case-a-year winery plans to start an appointment-only tasting room at the winery in The Barlow center next spring along with some increased retail distribution. Michael Browne’s last vintage of Kosta Browne wines was 2014, and he will now concentrate on his CIRQ label. It is hard to imagine that the winery will be able to prosper without the charismatic founders Dan Kosta and Michael Browne at the helm, but the winery name remains one of the most recognizable among Pinot Noir cognoscenti. Cheese Matches for Pinot Noir (Taken from Windy Oaks Estate, “A Cheese Plate for the Holidays”) Cow’s milk alpine cheeses: Abundance, Appenzeller, Beaufort, Comté, L’Etivaz, Gruyere, Pleasant Ridge Reserve, Raclette, Tomme de Savoie. Washed-rind cheeses: Fontina, Pont-l’Eveque, Taleggio. Bloomy-rind cheeses: Brie, Camellia, Camembert. Fresh or aged goat’s milk cheeses: Monte Enebro, Saint-Maure de Touraine, Tumalo Tomme. University Genomic Study of Grape Evolution University of California at Irvine evolutionary biologist Brandon Gaut and University of California at Davis plant biologist Dario Cantu compared the sequenced genomes of wild and domesticated European grapes and found evidence that people may have begun eating grapes as many as 15,000 years before grapes were domesticated as an agricultural crop. Humans gathered grapes in the wild for centuries before domesticating them. The researchers also found that modern grape genomes contain more potentially harmful mutations than did the grape’s wild ancestors. These accumulate through clonal propagation over the centuries and their identification may be useful to winegrowers. The study was published in The National Academies of Sciences. Infographic on Most Important Wine Soils For soil nerds only: 14 Wine Soil Types to Know: www.vinepair.com/articles/illustrated-guide-wine-soils/. For more in-depth reading: The Dirty Guide to Wine, written by Alice Feiring and Pascaline Lepeltier, MS. Moderate Drinking and Atrial Fibrillation A recent cohort Norwegian study published in the Journal of the American Heart Association, “Does moderate drinking increase the risk of atrial fibrillation?”, concluded that although alcohol consumption was associated with a curvilinearly increasing risk of atrial fibrillation in general, the attributable risk of alcohol consumption within recommended limits among participants without binge or problem drinking was negligible in the population studied. A second cohort study published in the journal JACC Heart Failure, “Moderate alcohol consumption is associated with lower risk of heart failure but not atrial fibrillation”, found that consumption of alcohol in moderation was associated with a lower incidence of heart failure, but not with the development of atrial fibrillation. No association of alcohol consumption with onset of atrial fibrillation was observed. 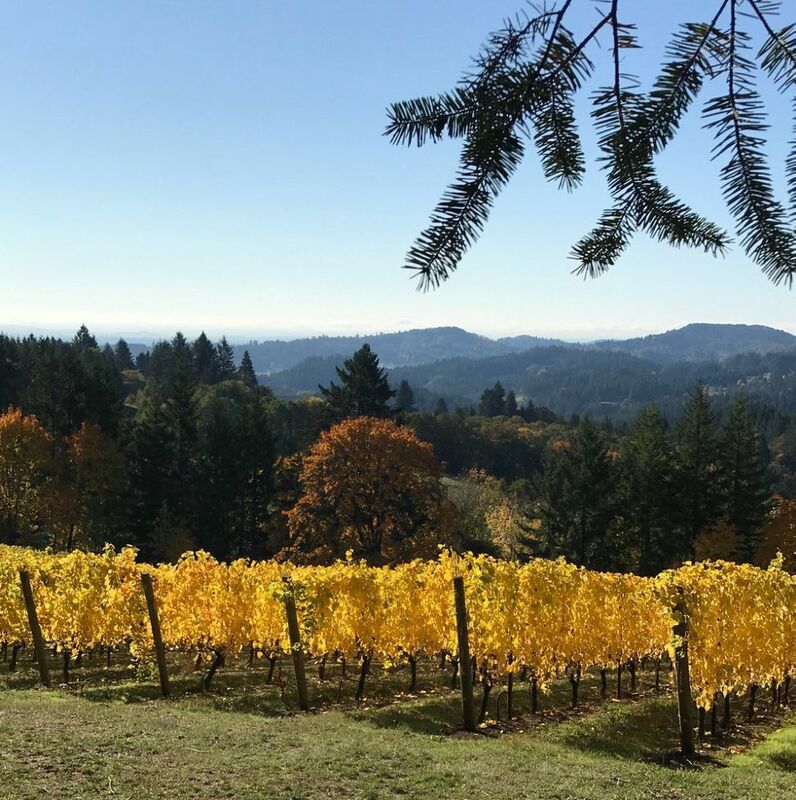 Luminous Hills After Harvest As Pinot Noir harvest in California and Oregon has concluded, this photo at Luminous Hills Vineyard in the Willamette Valley posted on Twitter provides a beautiful memory of fall.